OMEGA™ FST-200 Series flow switches use thermal dispersion technology to create a very accurate and economical method of sensing flow. Monitor fluids from 0.4 to 1.2 specific gravity, 1 to 300 cp, and pulsating flow from 10 to 100 pulses per minute. The sensors incorporate two temperature probes, one of which is heated. The flow of liquid reduces the temperature of the heated probe, decreasing the temperature differential with the non-heated probe. OMEGA’s LVCN-131 and LVCN-141 of controllers can easily be interfaced to perform a variety of control functions. 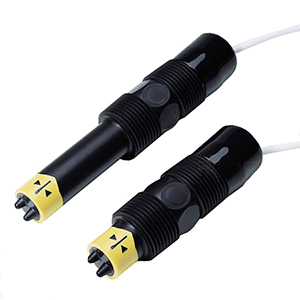 To order with 7.62 m (25') cable, add suffix "-25" to model number, add $20 to price for PP/PVDF, or $75 for PVDF. Sizes above 1/2" fit into 3/4 NPT fitting adaptor.